The potential savings will be impacted by the climate zone, local power rates, and personal operating practices. The following savings show the potential for EcoBreeze 2 for different cities and are representative for a 400 ft2 room that is presently not using any outdoor air cooling. 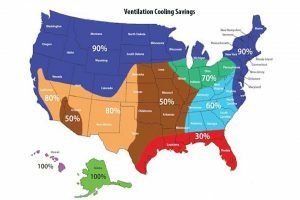 Rooms that already take advantage of outdoor cooling will have lower savings. Energy savings for a 400 square foot room requiring 10,000 BTUH. Mild cities with cool evenings will have higher savings rate and a lower energy cost. Warmer cites will benefit in the spring and fall but will have limited impact on hot summer days. The energy cost is higher so the savings will be substantial. The following shows the potential savings by climate zone. If you already use outside air for cooling, you understand and appreciate how it helps lower your cooling bill. Now you can use EcoBreeze 2 to automate the process and add to the savings. Using window fans, closing the windows during the day and setting back the thermostat are proven techniques to save on cooling bills. Moving cool outdoor air uses 90% less energy than creating it with an air conditioner. EcoBreeze 2 adds to these savings in two ways. 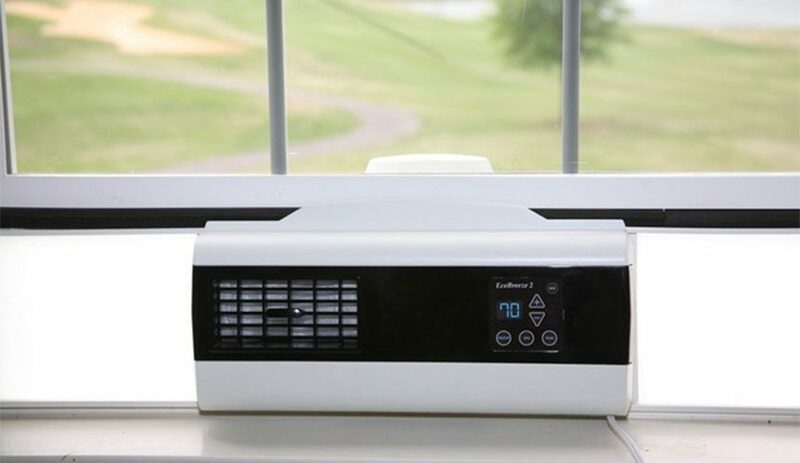 It has a high efficiency motor and fan that use 75% less energy than current window fans and it has a patented smart technology that maximizes the use of outdoor air cooling and minimizes energy consumption. The smart technology automates the entire cooling process so that operating the fan is as hassle free as setting a thermostat. Set the EcoBreeze thermostat to the desired indoor temperature and the auto mode controls the cooling. It continuously monitors the indoor and outdoor temperatures and humidity and uses this information to maximize outdoor air cooling. 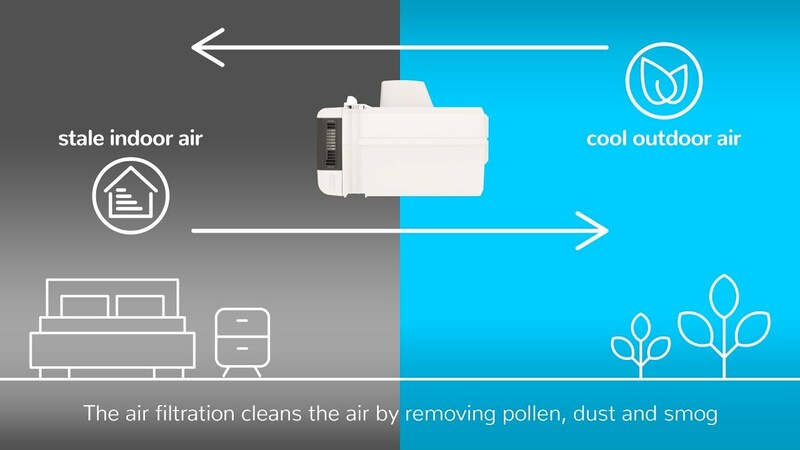 Anytime the room needs cooling and outside air can be used, the smart technology does the rest. It starts on the energy saving low speed and gradually ramps up to high speed as the outdoor air cools, then ramps back down to low speed as the room nears the set point. When the room is cooled or the outdoor temperature is too warm it turns off and closes damper doors sealing out the warm air. Now you can use outdoor air rain or shine, when your sleeping and when you are away to maximizes outdoor air cooling. 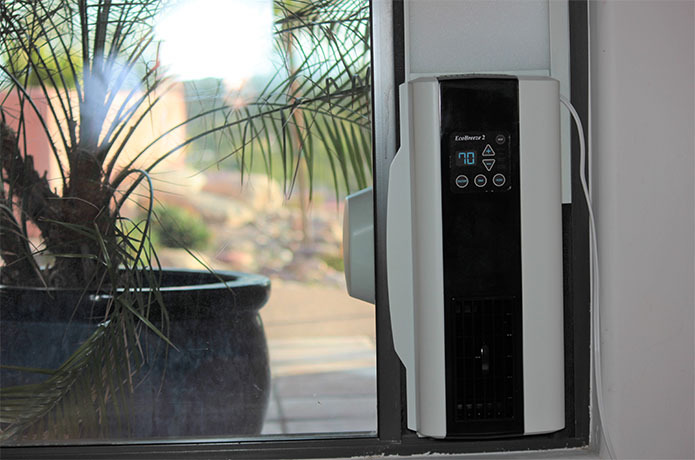 EcoBreeze 2 sets the new standard for energy efficiency. It has the most efficient motor and fan that we could find. On low speed it uses 8 watts, and when it cools it will use 75% less energy than traditional window fans. How much energy can I save? The answer is it depends!